What are the common forms of impetigo in babies? How does a baby get impetigo? What are the risk factors of a baby getting impetigo? What are the symptoms of impetigo in babies? How is impetigo in babies treated? How can parents manage impetigo in infants? Can impetigo in babies heal on its own without treatment? What are the complications of untreated impetigo? How to prevent impetigo in babies? It looks like an ordinary sore, but it is not as harmless as it seems. Impetigo in babies starts as tiny blisters that can slowly spread to the other parts of the body. Timely diagnosis and treatment are essential to prevent complications of this skin infection. But what causes impetigo and how can you prevent it? MomJunction tells you about impetigo in babies, its causes, symptoms, and treatment, along with the steps for prevention. Impetigo is a bacterial skin infection caused either by Group A Streptococcus bacteria or Staphylococcus aureus bacteria (1). The bacteria can infect the upper or deeper layers of the skin. Non-bullous impetigo, also called crusted impetigo, is the most common type that causes smaller sores and blisters. Non-bullous impetigo can be caused either by strep bacteria (Streptococcus) or staph bacteria (Staphylococcus). Bullous impetigo is a severe form of impetigo that causes large boil-like blisters that could fill with pus and burst. Bullous impetigo takes longer to heal than non-bullous impetigo. Only Staph bacteria cause this infection. Ecthyma is the most severe variation of impetigo where the bacteria infect the deeper layers of the skin. Ecthyma can be a result of infection by strep, staph, or both. Since ecthyma impacts the deeper layers of the skin, it is also called deep impetigo. Non-bullous is the most common type of impetigo, constituting about 70% of the total impetigo cases in infants and toddlers (3). However, non-bullous impetigo is very rare among babies aged under e of two years. While bullous impetigo mostly affects toddlers aged over two years, it can also affect infants and newborns. Ecthyma may often start as bullous or non-bullous impetigo, eventually spreading to the deeper layers of the skin. Contact with an infected person. A baby can catch the infection through physical contact with anyone with impetigo. Touching objects used by an infected person. Touching toys or other personal items of the infected person can also spread the bacteria. Infection of an existing rash. Scratching an existing rash, like an insect bite can cause the sore to break. The bacteria that cause impetigo are usually airborne and on the surface of the skin. When the bacteria find an opening in the skin, it colonizes the wound to cause impetigo. Certain conditions and health background can make some babies more prone to the infection than others. What Are The Risks Of A Baby Getting Impetigo? Living in hot and humid weather: Impetigo infections are common in the regions with high heat and humidity. In the temperate areas, the disease occurs during summers. Having eczema or psoriasis: If your baby has eczema, then they are at a higher risk of developing impetigo since the constant scratching can make the irritant sores prone to infection (4). Diseases that affect the skin: Other skin infections also increase the risk of impetigo. An example is scabies, which is caused by scabies mite that burrows into the skin causing large sores that can break (5). A baby with chickenpox can also catch impetigo on scratching and rupturing the chickenpox rash (6). Babies at daycare: Babies spending too much time in crowded environments like daycare facilities are at a higher risk of skin infections. 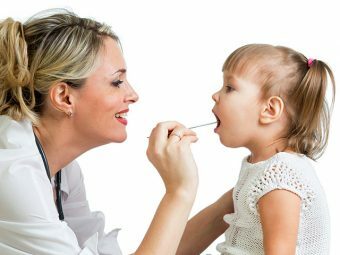 Baby with a strep throat: Strep bacteria that causes impetigo is also responsible for causing strep throat (7). A baby who has strep throat can pass the bacteria through sneezing or coughing and exposing an open sore on the skin to the bacteria, eventually leading to impetigo. Age of the child: Impetigo can happen in infants, but is most common among children between the ages two and five years (8). Immunosuppressed infants: Babies with suppressed immunity, especially those with HIV, are at a greater risk of developing bacterial infections like impetigo (9). If your baby belongs to the risk group, then keep checking for the symptoms of impetigo. The first symptoms of impetigo can emerge anywhere from a day to ten days after contracting the bacteria. They may vary depending on the type of impetigo (10). The earliest symptoms of this impetigo are redness around the nostrils and the skin above the upper lip. The fine red rashes turn into large blisters, spreading across the healthier skin on the nose and chin. Rashes soon take the shape of yellowish-red lesions or blisters. The yellow color is due to pus, which are clusters of white blood cells that attack the invading bacteria. The blisters burst and the lesions appear damp due to the fluid. After a few days, the broken blisters turn brownish-red with an outline of red crust around the sore. At this stage, the sore begins to dry and form a flaky crust. The sores are not painful but very itchy, and the baby may attempt to scratch them repeatedly. The first symptom is the development of pink to red-colored lesions about 2cm each in diameter, on various parts of the body. Gradually, the blister grows larger and develops a clear fluid within. The fluid gradually turns yellow due to the pus. The lesion itself begins to grow in size while also forming several smaller blisters around it. The blister bursts and the fluid drains away. The upper sheath of the blister dries and forms a white outline around the lesion, which stays red to dark pink for several days. Bullous impetigo blisters mostly appear around skin folds, such as the diaper region and the neck folds. Large pus-filled sores that mostly appear on the legs (11). Ecthyma sores may also appear on the buttocks. The sores get wider with a perforated circumference. You can tell the sore is quite deep by observing how sunken the center of the lesion appears. The sore can even get wider than an inch. Ecthyma sores can be itchy but are mostly painful. The sore dries, losing the yellow color to turn purple-red. Sometimes, the baby may also develop a mild fever while the bacteria spread rampantly to the healthy skin. So take your baby to the doctor if you suspect they have impetigo. How Is Impetigo In Babies Diagnosed? A doctor can diagnose impetigo by visually assessing the sores. In some cases, the doctor may take a scraping from the sore or a sample of the fluid from the blister and send it for laboratory analysis. The presence of bacteria in the sample will confirm impetigo. 1. Topical antibiotics: The compound called mupirocin is the most effective topical antibiotic for impetigo treatment (13). Doctors may prescribe a mupirocin cream or an ointment with mupirocin and other compounds, depending on the extent of infection. Antibiotic creams are applied liberally to the affected parts. The doctor may also suggest using warm water to clean the sores. This helps remove the crusts of the dead skin, thus making the skin permeable to the cream. As they have no side effects, topical antibiotic creams are often the first choice for treating impetigo in babies. 2. Oral antibiotics are preferred when impetigo has spread to larger part of the skin. Common oral antibiotics used for impetigo treatment are penicillin and amoxicillin (14). Oral antibiotics have several side effects including severe abdominal discomfort and are avoided by pediatricians unless necessary. The baby will start feeling better within a few days of commencing the treatment. The infection will resolve completely within ten days to two weeks, depending on the extent of the infection. Complete the entire course of medication even if the baby shows improvement within days. Completing the antibiotic course helps minimize recurrence and also prevents the bacteria from becoming antibiotic-resistant. Non-bullous and bullous impetigo does not leave scars, but ecthyma blisters leave scars. While treatment with medicines is vital, appropriate home management is also essential. Keep the sores covered. Dead skin from the sores and fluid from the blisters can spread the disease to the rest of the body, and to other people coming in contact with the baby. Therefore, it is important to keep the sores covered. Dress the baby in loose clothing that covers the scars but also allows ventilation. You can also cover the sores with loose gauze bandages. Trim the baby’s nails. Impetigo often spreads from the infected to the healthy skin through the fingernails. Trim the baby’s nails to ensure that the bacteria do not accumulate under the nails. Clipping the nails also minimizes the chances of scratching and bursting the blisters. Give diaper breaks. Bullous impetigo can cause sores around the diaper area. Let the baby stay without a diaper for a few minutes every day to air-dry the affected part. Air circulation allows the sores to dry quicker, which can accelerate the healing process. Wash the baby’s hands periodically. Your baby may accidentally touch a sore and place the hand on other parts of the body or a caretaker’s skin. Wash the baby’s hands with a safe disinfectant soap once in every six hours to prevent the accumulation of the strep and staph bacteria on the palms. Clean sores once in a day with warm water. Besides a warm water bath every day, clean the sores once in every eight to 12 hours with warm water. Your baby’s pediatrician can prescribe a water-soluble anti-bacterial liquid to add to the water. Wash the baby’s laundry separately. Use warm water to wash the baby’s clothes separately. Use a disinfectant detergent to do the washing. Also, wipe clean the baby’s toys, and other personal items with a towel dipped in the disinfectant liquid. Stay indoors. Avoid going to the park or sending your baby to daycare. An infant with impetigo can quickly spread the disease to other healthy infants around them. Family members must observe precautions. Primary caretakers must wash hands every time they clean the baby’s sores. It is best to wash hands after you hold the baby or their items of use. Ask other members of the family to keep a distance from the infant and do not touch the baby’s items. Impetigo stops being contagious 48 hours after the treatment begins (17). Nevertheless, it is best to observe precautions until the sores dry entirely. The only home remedy for impetigo is bleach baths. Bleach, or sodium hypochlorite, is known to control the multiplication of bacterial colonies, especially that of strep and staph bacteria (18). Soaking an infected area for 15 minutes in diluted bleach water is found to be effective in cutting the spread of bacteria. The recommended amount of bleach is 1/4 to 1/2 cup of 5% household bleach in a bathtub (40 gallons/ 151 liters) of water (19). Do note that babies have different skin types and those with dry skin may find bleach bath irritable. Consult the doctor about the home remedy before trying it. Can Impetigo In Babies Go Away Without Treatment? Yes. Impetigo can resolve in 10-12 days without treatment. However, the American Academy of Dermatology states that skipping impetigo treatment can cause the bacteria to infect the deeper layers of the skin, leading to complications (20), which can be fatal for an infant. Hence, do not leave your baby’s impetigo untreated. Erysipelas: It is a condition where the bacteria create a widespread infection of the top layer of the skin. The condition causes large parts of the body to turn red due to infection. The infection is fairly common (21), and an ignored and untreated impetigo can better its scope (22). Cellulitis: It is similar to erysipelas, but here the bacteria affects the deeper layers of the skin. Cellulitis can be fatal since the bacteria can quickly pass into blood and muscles from the lower layers of the skin. Once in the blood, the bacteria may reach multiple organs of the body, causing widespread complications including permanent damage to some organs (23) (24). Erythema nodosum: The strep bacteria infects the subcutaneous fat tissue below the skin, causing it to inflame and redden (25). Glomerulonephritis: If the strep bacteria reaches the kidneys, it causes glomerulonephritis (26). The small coils of blood vessels within the kidneys, called glomerulus, get inflamed and have difficulty filtering the blood to form urine (27). Scarlet fever and rheumatic fever: They result in severe sore throat pain and rashes all over the body (28). 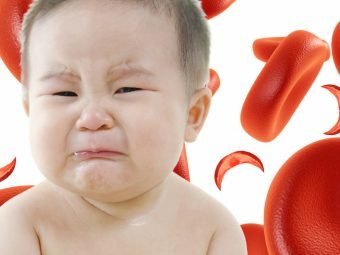 Scarlet fever itself can complicate to rheumatic fever, which causes severe damage to essential organs like heart and brain (29). Untreated impetigo results in complications that have a lifetime impact or are outright fatal. Treatment helps your baby avoid these conditions. But prevention is always better than cure. Maintain good hygiene: Impetigo is caused by strep and staph bacteria that are commonly found in the environment. Follow basic hygiene in your home and around the baby. Washing hands soon after using the toilet and coming in from the outdoors is important to keep infections like impetigo at bay. Keep the baby away from people with a cold: If you or any other family member has a cold, then keep away from the baby. If the primary caretaker has a cold, then she can wear a mask while holding the baby. Common cold and sore throat are often a result of strep bacteria, which also causes impetigo. Avoid sending the baby to daycare: If you have a chance, then avoid sending your little one to the daycare center. An infant can contract impetigo from another infant or a caretaker at the facility. Prevent scratching of wounds and open sores: If your baby has a wound or an insect bite, then keep it covered with loose gauze bandages to discourage scratching. Trimming nails is also an excellent preventive measure. Do not share personal items with the baby: Maintain separate towels, clothes, and utensils for a baby. Do not share them even with the baby’s siblings. Impetigo can unknowingly pass from a person to another through the use of common items. Keep the nose clean when the baby has a cold: Strep and staph bacteria often colonize the nose and cause cold with a runny nose. Medical experts suggest spreading a layer of anti-bacterial cream on the baby’s upper lip and around the nostrils to prevent bacteria from infecting the skin (30). You can consult your baby’s pediatrician to learn about the appropriate anti-bacterial cream. 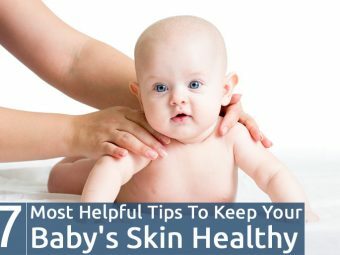 Do not overlook any crusty, yellowish lesions on your baby’s skin. If the baby is showing any symptoms, consult a doctor right away. With the right treatment and use of antibiotics, impetigo symptoms will start to subside in two weeks. Do you have any tips or suggestions to prevent impetigo in babies? Share them in the comments section below.